This freakishly warm weather is awesome, but confusing. I mean, yesterday I was wearing my winter peacoat, and today I wore a tank top. It feels like summer, but the leaves are turning colors. And I'm posting about winter squash when it feels like we should be eating corn and tomatoes. But I guess even if the temperature says otherwise, it's still fall. This is the first winter squash dish I've cooked this season. I'd been seeing recipes for stuffed squash pop up on some other blogs, and was inspired to create my own take on it. I love the combination of wild rice and mushrooms in a vegetable stuffing, so I went with that and flavored it with the "Scarborough Fair" herbs: parsley, sage, rosemary, and thyme. This recipe takes a while to make, as both the squash and rice take some time to get fully tender, but it is worth it. It's flavorful and satisfying, with a nice mix of textures. I think it would make a great vegetarian addition to a Thanksgiving table. How have you been enjoying these unexpectedly warm days? If the shell of your squash gets very tender, then you can go ahead and eat it. If not, you can just scoop out the flesh and stuffing or cut off the shell as you eat. Place a rack in the middle of the oven and preheat oven to 450 deg F. Halve the squash lengthwise, remove seeds, and place squash in a baking pan. Roast squash in the preheated oven until it is beginning to soften, about 30 minutes, then remove it from the oven. Meanwhile, heat a splash of olive oil in a large heavy saucepan over medium heat. Add onions, garlic, and carrots and saute until vegetables are softened, about 5 minutes. Add mushrooms and saute until they have shrunk and lost most of their liquid, about 5 more minutes. Stir in thyme, rosemary, sage, and rice. Add water or broth and bring mixture to a boil. Reduce to a simmer, cover, and cook until rice is tender, about 45 minutes. If mixture dries out before the rice is cooked, add some more liquid. Stir parsley into rice mixture and season to taste with salt and pepper. Stuff squash with rice mixture, cover pan with foil, and bake until squash is fully tender, about 20 minutes. definitely confused :) but hoping to get out on another bike ride tomorrow!! 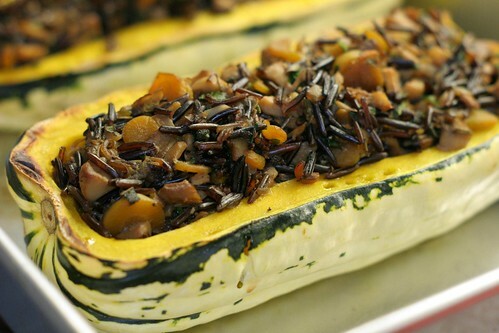 Stuffed squash is definitely a great dish for cooler temps... which are coming back soon I'm sure! So beautiful and fuss-free (even if we are having a mid-autumn heat wave)! I never know what to wear outside anymore...but I certainly know what to eat! I love this stuffing. Can't wait to try it! Well I think the heat wave is over, and this looks like a great dish for the cooler weather that's coming back soon! Wow. That looks amazing. I've never had that kind of squash before. I'll have to try it! I got a couple of this type of squash in our farmshare and I didn't know what they were. I roasted them with a butternut squash and made a big pot of soup. This was the first time I'd used ginger on the fly...It turned out very tasty.